It is tradition of the Catholic faith to celebrate mass in the remembrance of the dead after one month has passed. Today throughout Haiti, at 7 am, in what is left standing of the parishes of Port au Prince, this mass will be celebrated for the estimated 200,000 dead. In addition, President Preval has declared today to be a day of national fast, and the beginning of three days of national mourning. We are participating in this act of solidarity by offering mass at 7 am at Titayin, together with Bishop Dumas, at the burial place of the indigent dead. We ourselves have buried about 2,500 people there in the last 30 days. After weeks of frenetic activity, we are returning to a state of equilibrium. Our hospital had become a trauma MASH unit, as had all other medical centers in Port au Prince that are still standing. We were able to offer about 30 surgeries a day at four sites (two in our hospital, one on our hospital grounds in a tent, and one at the St. Camillus Hospital, which we staffed for the emergency.) Many of these, sadly, were amputations – sometimes two for the same adult or child. To give an idea of the size of the problem, it is likely there are about 20,000 people now who have been amputated or who have orthopedic hardware screwed through their skin to the bone. 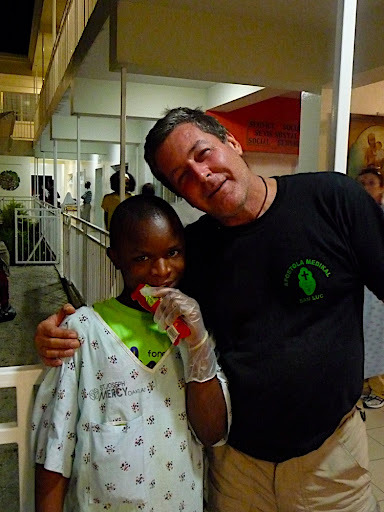 Port au Prince estimates about 20 Haitian orthopedic surgeons, and visiting teams to Haiti will soon leave. All 20,000 need to be followed closely for removal of hardware, control of infection, reevaluation of the amputation, and of course for artificial limbs and rehabilitation. We have worked closely with the St. Camillus Hospital so as to return our St. Damien Hospital to a pediatric center and to have a growing center for adults at St. Camillus. In collaboration with the Papal Nuncio, the president of the Haitian bishops conference, the local CARITAS office and the Italian Protezione Civile, we are setting up seven positions in the provinces, (especially since about 30% of the population has abandoned the capital) to be able to allow access of these people to a medical system. We can do our best to follow a certain number from these sites, return them to Port au Prince for needed attention by helicopter or land, and use the points as well for large distributions of food and educational materials for schools. We hope to continue to partner with St. Camillus and the Haitian bishops to strengthen a similar response in Port au Prince. At Francisville, we are making a center for production of artificial limbs. Gena Hergaty hosted a meeting two days ago of 30 non-governmental organizations at our St. Germaine program, to determine the best collaboration for all those eager to invest in rehabilitation and physical therapy. On the home front, Erin Kloos has made an exceptional recovery after being dug out of our crumbled Fr. Wasson Center. The funeral of her brother Ryan will be later this month in Phoenix. Fr. Craig Hightower celebrated the funeral of Molly Hightower, concelebrated by Fr. Phil Cleary. I hope I can arrange to leave Haiti for a few weeks to see my father, and to visit both families for mass in their homes. We offered mass last Saturday for Molly and Ryan on top of the rubble of the Fr. Wasson Center on an altar made of fallen block, using chant and incense to honor Molly and Ryan and all who died in the earthquake, and to show our faith and hope, and determination to rebuild and continue our life giving mission. The Fr. Wasson Center is being cleared by heavy government equipment, and we will rebuild a central administration center on the site, with metal instead of cement framework, which are fast becoming popular here. We will also make an artistic monument to stand prominently on the corner, by a famous Haitian artist, dedicating the new center to Ryan and Molly and honoring all the victims of the earthquake. In Tabarre our three areas of destruction were the perimeter walls, the tower, and the chapel. The Italian Protezzione Civile is clearing the debris, reinforcing the tower, rebuilding the chapel and rebuilding the walls. Additional internal, non-structural damage to the hospital is being repaired by the Italian companies that made the initial installations (especially the central oxygen supply). The new maternity and neonatal program, born of necessity during the traumatic days following the quake, is following a good and logical course, and the rest of the hospital is returning to normal. The surgical capacity will still be challenged as we tend to many postoperative children and new traumas. The cancer center got quite a boost, thanks to Sister Judy, as it is now a partner with the Danny Thomas Children’s Cancer Hospital in the USA. This will bring quite a help for development, diagnostic, training, material and medicines. The St. Helene orphanage in Kenscoff was largely spared, but we were glad to see so much charitable activity on the part of the children, coming to the hospital to visit injured children and distributing food and supplies in the tent cities. The Family Services team has been very attentive to vulnerable children in the tent cities and has elaborated a good plan for continued involvement. Future reports will be given on all these points I mention in this summary by the people involved. We are still gathering the names of those who have died or disappeared in the rubble. We hope soon that Daniela, our temporary home correspondent, will be able to make a memorial page on the NPH website. We are very much struck with sorrow by the deaths of our colleagues or deaths in their families. The St. Luke program has been valiant and tireless, and we suffered the loss of some staff and directors. We also suffered the loss of one third of our 18 street schools. We will resume school in tents, as soon as we have enough, and thanks to Artists for Peace and Justice, we are studying all aspects of rebuilding. Everywhere around us there are huge problems. There are wounded, homeless and hungry among our 800 employees (all programs combined, including St. Luke). This is made more dreadful by the advance of the rainy season. We had our first rain yesterday. In a separate letter over the next few days, I will outline the investment we hope to make in addressing these three social problems and the rebuilding and advance of our own programs. For today, please join us in mourning. Join us in prayers for the dead, for the living, for the future.